The Rosenstiel School History Committee, chaired by Dr. Robert N. Ginsburg, began producing an oral history of the Rosenstiel School in 1988 with a recorded conversation with the founder and first Dean, F. G. Walton Smith. Almost thirty senior scientific and technical staff members were interviewed on audio cassette tapes, and the tapes were transcribed by Elosie Zakevich and Jean Yehle, of RSMAS. 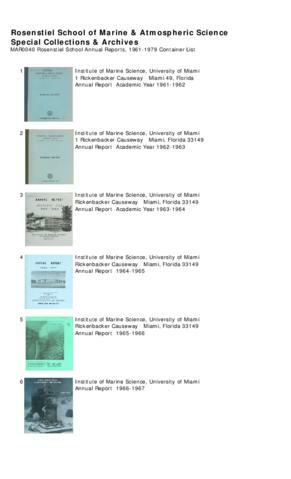 Annual Reports issued by the Institute of Marine Science / Rosenstiel School of Marine and Atmospheric Science at the University of Miami. These reports summarize the Board of Trustees, the Administration, the Faculty , Staff, and Students, the financial outlook, fund raising efforts, improvements and changes, as well as research initiatives, outreach, and goals. Requests to publish or display materials from this collection require written permission from the rights owner. Please, contact libcirc@rsmas.miami.edu for more information.